I’m really interested in what you think will become of my third egg. The first born is David. You can see a small black streak on his left fore head. The second born is Jesse. He does not have this little black streak. I’ve never had three hatchlings before. David and Jesse are getting very strong and aggressively taking the food that I offer. You know what I’m talking about. 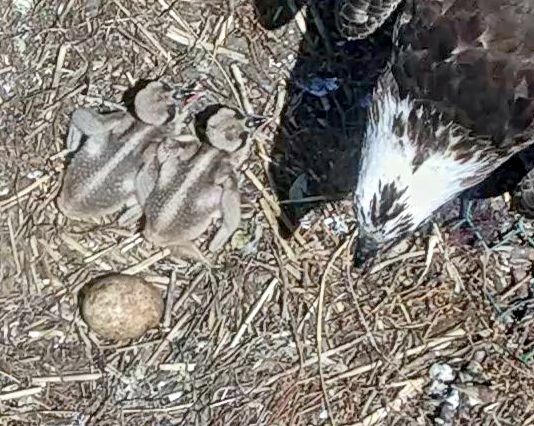 If this third egg hatches he/she is going to have a heck of a time getting his/her share of food. Knowing Mother Nature the way I do, I have my own thoughts. Third egg probably lost. David and Jesse have too much of a age and size advantage. The third, if hatched won’t be able to compete. 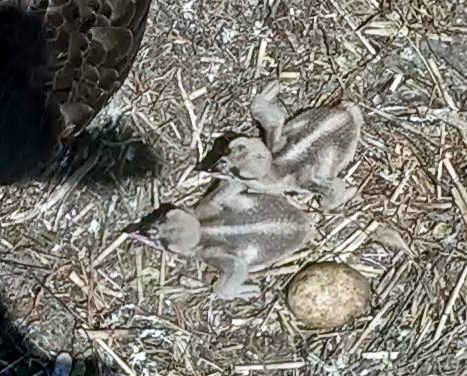 Due to the time delay, it is probably not hatching anyway and Harriett or Ozzie will remove it from the nest within another couple days. So sorry Harriett & Ozzie. Nature is often full of surprises. I honestly hope this will be one but I fear this little third hatchling has the odds stacked against him/her. The 3rd egg remains in the incubating sunshine. We might all be surprised.